There are pools of water on the site, particularly in the clay beneath the deposit of chalk (22) where Mick needs to plan. Muriel is baling it out! Chris is defining the south-western side of the cut containing (11), Mervyn and Peter are continuing their investigation of fill (25) and Tony is sorting out whether the flinty deposit in the north-western corner is the same material as (21) or is something distinct. Having checked Cuniffe’s Iron Age Communities in Britain for Middle Iron Age pot forms, I am happy that the material from (25) may be of that date. I’ll need to compare it with the Iron Age ceramics from Blackhorse Road, as they provide the closest assemblage, but there’s also James Dyer’s stuff from Ravensburgh Castle. On the other hand, the fabric is rather harder than I would expect from prehistoric ceramics and I wonder if the decorated sherd is more likely to be medieval: the plain, dark sherds still look Iron Age to me in their unwashed condition. As excavation has progressed, so an iron nail has turned up, as have a sherd of a vessel with a baggy base and a rimsherd of St Neots type ware, so the pit is conclusively medieval. The edges of the feature containing (11) are becoming much clearer: it highlights the problems of excavating when conditions are very dry, as the edges were all but invisible two weeks ago. It is still unclear what is happening at the ends of the feature, particularly to the south-west, where it looks to be cutting an earlier feature, perhaps a posthole. 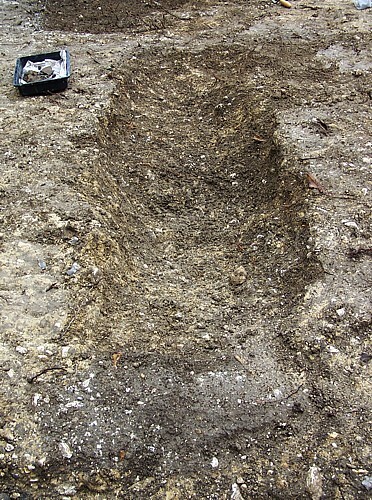 It soon became evident that where Tony is digging is the same as (21), simply with more flint than chalk. Yesterday, he found part of a belemnite, broken along the centre of its shaft; today he found the matching half a short distance away. The natural (17) is rising up sharply beneath it, making the hollow to the south-west more clearly linear in character, as it appears on the north-eastern side of the site. The feature containing (11), which does not yet have its own context number, is now quite clearly linear, coming to a pointed end to the north-east and completely truncated to the south-west. It’s produced medieval material, including St Neots type ware, so it’s perhaps contemporary with the pit containing (25) (and, beneath it, (29)), which is just beyond its north-eastern termination. I spent the afternoon in Letchworth Museum. I returned to site around 6.30 p.m., where Bob Lancaster, Mick, Muriel and Tony had started to transport stuff into the field for the Open Evening. We had a refreshment table, operated by Bahkti, offering wine and nibbles, with another table to display a selection of finds (including all the small finds). The material looks good when spread out and will make a decent finds report. I gave a guided tour of the site, explaining why we had selected Church Field and why we then fixed on the south-western corner. I showed people around the trench, explaining why I thought things are the way I interpret them. Putting it all together like that makes the story sound not just coherent but actually rather interesting. By the time we packed up, it was getting rather dark, but I think that all our visitors appreciated what we have achieved after almost four weeks. 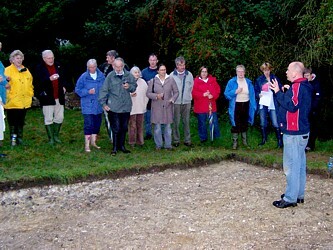 Posted on 23 August 2007, in Fieldwork, Norton Church Field Dig 2007. Bookmark the permalink. Leave a comment.